175g of pure African black soap. 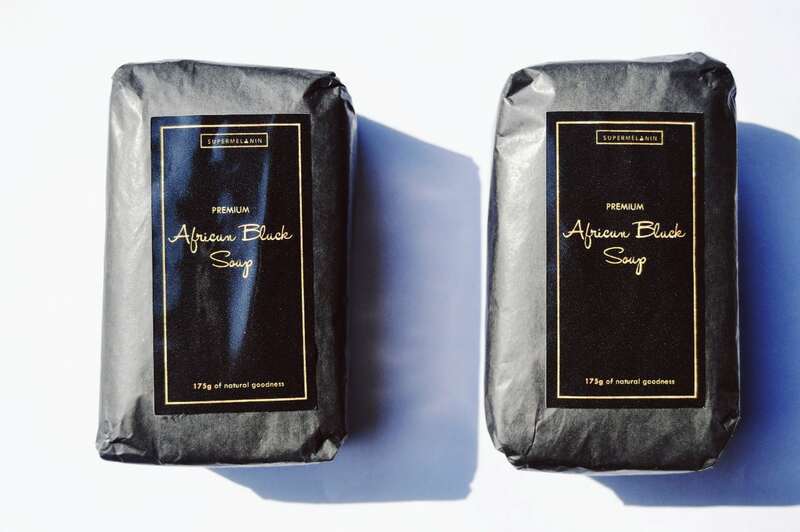 BUT WHAT ARE THE BENEFITS OF USING AFRICAN BLACK SOAP? 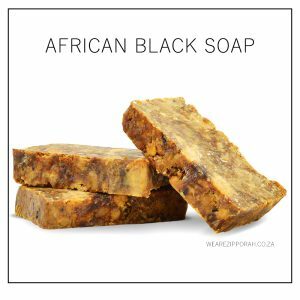 OKAY, HOW SHOULD I USE AFRICAN BLACK SOAP FOR MY SKIN TYPE? Be sure to use moisturizer or a hydrating mist, a serum, or shea butter afterwards, especially if your skin tends to be dry, and during winter months when cold weather could further dry out the skin. QUICK TIP: If you have dry skin, make sure you are layering your skin with moisture. Start with an oil/ serum and seal with a daily hydrating mist. African black soap is great for oily and acne prone skin. It’s efficient for deep pore cleansing because of its natural exfoliating qualities. For some oily skin types it seems to keep the skin hydrated without increasing oil production. Even if you have oily skin you should moisturize afterwards with a non-comedogenic (doesn’t clog your pores) lotion or oil like sweet almond oil and virgin coconut oil. QUICK TIP: We also recommend gently cleansing with African black soap and then steaming with a steamer/ a bowl of hot water before applying a lightweight oil. If you are using raw African black soap, take the soap apart and knead it into a ball to make sure there aren’t any jagged edges, and rub between hands to work into a lather. Do so in gentle circular motions focusing on problem areas. Washing and rinsing with cool water can help reduce the possibility of stinging and redness. Avoid getting the soap in your eyes. If you have sensitive or very reactive skin, don’t leave the soap on the skin for a long period of time. WHAT IF I EXPERIENCE BURNING OR STINGING? If this is your first time using African Black Soap, you could experience tingling or a burning sensation in acne areas, open sores and cuts. Reduce the amount you use until your skin is comfortable. If your skin feels squeaky clean afterwards, it probably means your skin is too dry. Try reducing the amount of soap that you use. A very small amount (the size of a grape) can cleanse the face and neck. Okay Great, So How Should I Use African Black Soap for my hair? Step 1: After your pre-poo, dampen your hair. A bar of black soap needs moisture to activate it. Step 2: Rub the African black soap bar through your hair to remove build up. Focus on your scalp. Saturate your hair with as much as the lather as possible. Step 3: Leave the black soap on your hair for about an hour. Step 4: Thoroughly rinse your hair using a little warm water. Scrub your scalp with your fingertips in circular motions as you rinse the black soap from your hair. Step 5: Now add some Moisture Me to your hair while damp and seal with shea butter coconut smoothie. 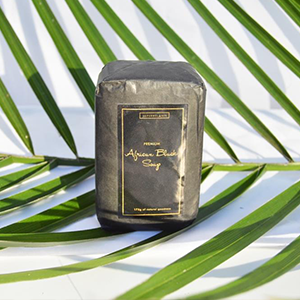 African Black Soap’s light brown colour comes from its ingredients: the ash of palm bark and the plantain leaves and bark are first of all carefully sun dried, then gently roasted at an even temperature. Hydrating Shea Butter, Palm kernel oil and water are then stirred into the healing mixture; and then the soap is left to cure. 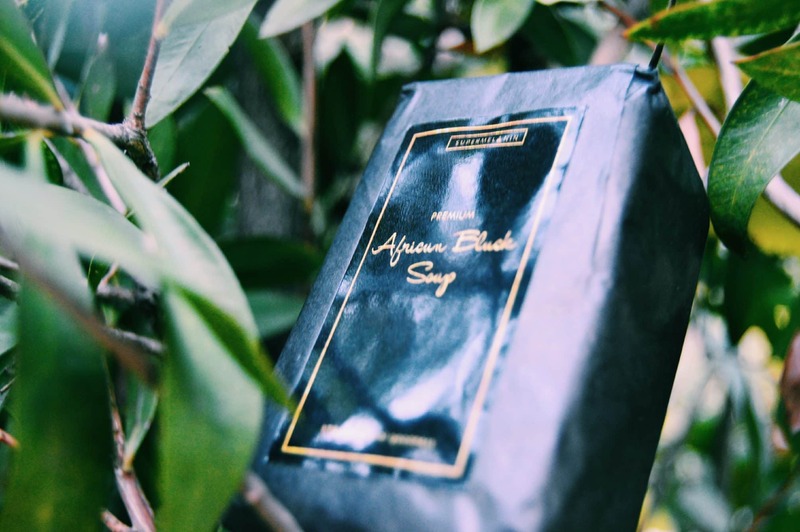 Supermelanin African black soap is handmade in West Africa, where different women-led communities create magical secret blends to create the African Black Soap we know and love. Great quality. Fast delivery. What else can I ask??? I just wanna say that it’s been about a week since I started using African black soap and my PIH/scarring has noticeably decreased. It seems as if the scars, which for me are quite clumped together, is evening out. I’m not sure if it’s the vitamin E that’s active in the soap that’s doing this but whatever it is I am eternally grateful for it. Here’s to everyone getting their skin under control. Start with African black soap. I’m serious! After three days of using this soap, I had four new cysts, and I was breaking out on my forehead(where I never get acne). At first, I thought this was just my skin purging, but with more research with this product, I know that this is not possible. The only thing that can make you purge is products with actives in it, which this product dosent have becuase it is all natrual. If this product is breaking you out, your skin dosent agree with it, and you should stop using it. My sister has different skin from me and really loves it, because it works for her. I guess it’s not for everyone. Great product. Will continue to purchase. So it’s been about a month since I started using black soap and honestly the results are incredible. I went from having very defined and textured scars to light and faded scars. The texture of my skin has also dramatically improved. This is something everyone needs in their regimen. I stopped taking my birth control six months ago which resulted in the skin on my face becoming extremely oily. My face is clearer and i feel more confident now. It can be drying, you need to use a moisturiser afterwards. It’s GREAT for someone with oily skin/ combo skin like me. I wash my face with this before applying makeup and I can tell it helps with preventing oil. I don’t like giving 5/5 reviews as no product is perfect, but will make an exception. This might not be the most cute or glamourous looking thing in your bathroom counter or shower. To be frank, it will look like **** sitting on your soap dish. But hey, if you can get passed the unappealing look this thing really works! It’s on the cheap side too honestly a very good buy. I looked into abs a lot. When looking for abs it needs to be raw organic , and 100% pure unrefined. This one comes in a big block I cut it in half and put it in two zip lock bags then I use one of the half at a time and cut pieces off . Each piece lasts me about two days . I got a soap holder from Dischem and put the pice I cut off one of the blocks in it . Never put the soap directly on your face it will scratch you ! Rub it between your hands and use the later from yours hands on your face . I have been using abs again for about two weeks ‘ I tried it about a year ago and gave up after a week ‘ I use it at night to wash my makeup off and then I use first aid beauty ultra repair face moisturizer. No more toners or oils I’m trying a simple more natural route . You will need a moisturizer with abs!!! My acne is hormonal, so I haven’t noticed any difference, but I think it would work for people who have non-hormonal acne. In the morning in the shower I barely touch the soap just like hold the wet bar and wash my face with that . And follow by moisturizer. Since cutting my routine and using blakc soap and only moisturizer my face has improved about 35 % in two weeks ! I have been getting a lot of compliments! Wich is great to hear expecially when all you do is obsess over your face . Hearing good feed back is amazing ! I plan to stick to this routine for a minimum of two more months and see where it takes me. Less is more. Pat your face with the cloth or towel and never scrub! If your skin gets irritated, you are probably allergic to some of the ingredients, and you should try something else. When I first used it, it stung a little, so I diluted mine more. If you’re using ABS to heal your skin it can take about a month or more. I has acne a while ago it cleared up but i still have a bit of scarring. i have been using this for about 2 weeks now and honestly its great!!!. ive never had a cleanser that has managed to totally remove my makeup with out wipes, im really impressed. it did sting the first couple of times but that stopped. i also have dry skin but if you mosturise properly i use the shea butter or cocoa butter and you’ll be fine. its really cleared up my complexion, its fantastic. Make sure to get a 100% real African black sop. It should be lumpy looking and be varying in colour from light brown to dark brown not uniform in any way. It will be sorta soft and crumbly. Take a bottle fill with water add about a quarter or so or your black soap to the water. Wait overnight it will dissolve attach a pump and use this liquid soap on your face twice a day. It will be drying (at least to me it was and I have extremely oily skin use a good moistureizer, I use jojoba oil) it took almost 3 weeks but I can really and truly see a difference. At first it just seemed to help my acne heal faster but I’ve been taking pictures of my acne daily to see if things actually change or if I just forget how bad it can be (I recommend every does this). Pictures don’t lie my acne is at least 60% less and significantly less red and this is more astounding since I just got off of my period and I normally break out bad then. Been using the soap for about 2 months now. My marks faded away, my pimples are gone and my skin is balanced and moisturized. The soap is especially helpful during summer when my skin becomes more oily. My only issue is that it smells very earthy like soap. i use this 80% of the time i shampoo my hair. My scalp is a bit oily so i leave it on for about 10 mins or so. Really nice. Thank you for this. When I use the soap regularly for my skin, my pimples disappear twice as fast. I won’t hesitate to recommend this product to anyone. It lathers really well and left my face feeling clean. Only downside is that it’s a bit too drying for my hair, Hair: 4. Skin: 5. I love it but I feel like I must do an acid rinse with this soap or my hair tangles. I use Apple Cider Vinegar. I use a couple of drops of olive oil after an ABS wash and vinegar rinse and I’m really seeing results. If youhave really sensitive skin like me, it can be really hard to find something that doesn’t cause your skin to breakout. I diluted this black soap quite a lot and its working well for me. Aswell, it’s perfect for taking off make up after a long day. Hello Pulane, great question! You can click on “ADD CART” and the soap will be added to your shopping basket. Next, you can pay using internet banking or deposit the money into our account. We will send you an email with banking details. Once payment clears, it takes about two to three working days for the soap to arrive. Thanks! You can only place your order online. Delivery takes 2-3 working days. Thanks! Thanks for the message. Delivery to Cape Town is R80. It takes 2-3 working days max. I am in Johannesburg , Auckland park. How much will the delivery cost? Hi Anzile, thanks for the message. Delivery costs R80 nationwide and takes 1-2 working days :).